Scientific Metals: Uniquely Positioned To Meet The Surging Demand For North American Energy Metals | Energy and Gold Ltd.
Scientific Metals (TSX-V:STM) is committed to becoming a key North American supplier of critical energy metals. Energy metals used in rechargeable batteries such as lithium, cobalt, graphite, nickel etc. are experiencing surging demand as Tesla ramps up its production schedule and other electric vehicle manufacturers follow suit. The situation is made all the more potentially turbulent given the fact that the Democratic Republic of Congo (DRC) is currently responsible for supplying more than 50% of the world’s mined cobalt. Moreover, Elon Musk has not made it a secret that Tesla is not open to sourcing its energy metals from outside North America. This increasingly unsustainable dynamic creates an urgent need for North American energy metal resources. Enter Scientific Metals, a company which recently acquired the Iron Creek cobalt property in the Idaho Cobalt Belt. The Idaho Cobalt Belt is the only prominent region of potential to develop Cobalt mines in the United States. In fact, there is only one other cobalt mine in the United States slated to move into production in the next few years, Formation Metals (which is located in the same Idaho Cobalt Belt as STM’s Iron Creek property). A substantial amount of historical work was completed at Iron Creek by Noranda in the 1980s before the implementation of NI 43-101. STM is committed to conducting its own drill program at Iron Creek over the coming months in order to estimate resources that are compliant with the estimates to current CIM definition standards. We recently connected with Mr. Kirwin to gain some additional color on Iron Creek and STM’s overall vision for being a key supplier of North American energy metals. CEO Technician: Please tell us about Iron Creek and what STM’s next steps are. Brian Kirwin: First of all, there’s a substantial amount of data which describes the cobalt deposits on Iron Creek. We have another trip to the site planned very soon (in the coming days, not weeks) which will include an author that will be tasked with producing a new 43-101. We’ll be able to produce a 43-101 report very soon and it will be able to codify everything that is known now. There is a substantial amount of infrastructure already in place and with a little bit of road work we should be able to connect the drill roads to the existing road network. In addition, without a heck of a lot of work we should be able to open up two portals to be able to access the underground. Overall, the underground workings appear to be in pretty good shape. To infill and gain confidence in terms of resource classification; the data density appears to be nearly sufficient to support an inferred resource right now. We will go in with the objective of moving it up to at least an indicated category. The 2nd objective will be to explore and expand the resource. The existing data indicates the potential to double the tonnage is sitting right in front of us. Scott Armstrong: Tell us about cobalt and why it is so interesting from a resource development standpoint in North America right now. 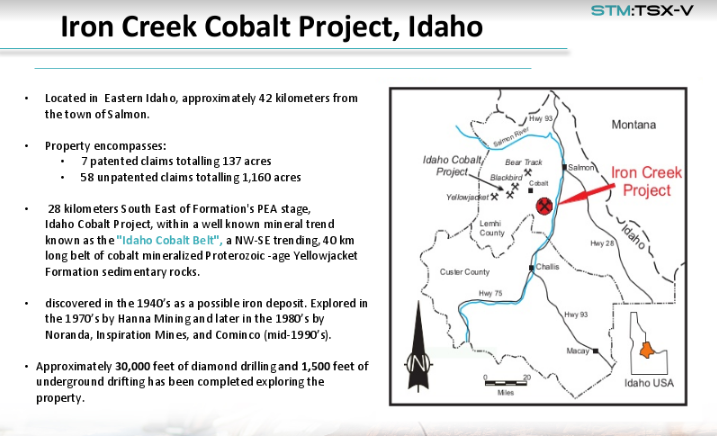 Brian Kirwin: There is only one other cobalt project set to come online in North America and that is our neighbor Formation Metals’ Idaho Cobalt Project. Cobalt is primarily mined as a byproduct which is a problem for supply and partially what makes it a compelling opportunity from a resource development standpoint. Tesla has made it very clear that they will not consider minerals from Africa with question human rights records as a source of raw materials supply. This statement alone removes more than ½ of the global cobalt mine supply from the equation and makes North American cobalt projects much more attractive. The Iron Creek project positions STM to be able to develop the 2nd cobalt project in the United States to come online, Formation Metals is the only one ahead of us. CEO Technician: What kind of timeline are we looking at in terms of permitting and construction at Iron Creek? Brian Kirwin: We are planning at least two rounds of drilling which will take at over a year. Then at least two years for permitting and another 1-2 years for construction. So if all goes well, we are looking at production beginning during 2020-2021 just as global cobalt demand begins to turn parabolic. Cobalt is perhaps the most interesting of the energy metals due to its extremely tenuous supply/demand picture over the next couple of decades. 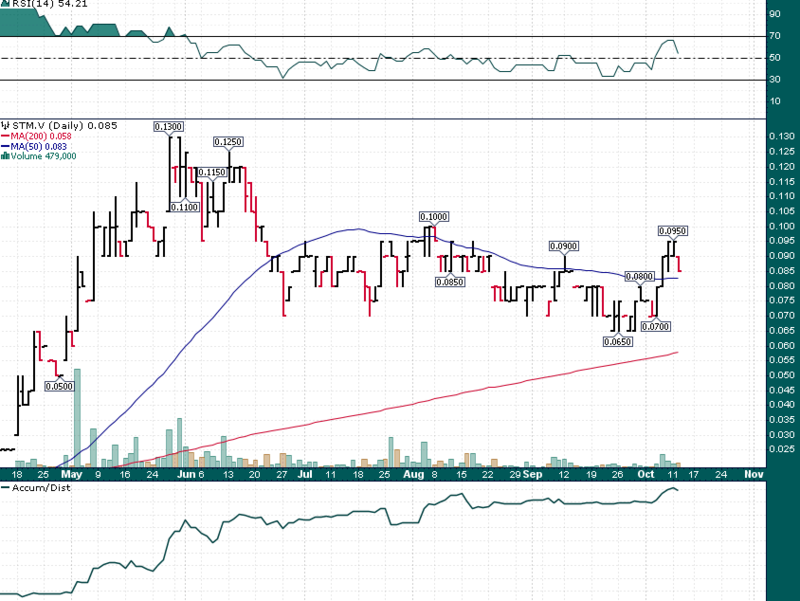 If STM is able to move ahead with doubling the tonnage at Iron Creek while completing an updated 43-101 compliant report the company’s current C$9 million market cap doesn’t seem to do justice to what could quickly become only the 2nd producing cobalt mine in the United States. The company’s Deep Valley lithium resource in Alberta and Paradox Basin lithium resource in Utah then become free lithium call options for STM investors who now have three ways to win owning STM shares. After surging higher in April and May, STM shares have spent the summer in a rangebound oscillation despite significant signs of accumulation on dips. The article is for informational purposes only and is neither a solicitation for the purchase of securities nor an offer of securities. Readers of the article are expressly cautioned to seek the advice of a registered investment advisor and other professional advisors, as applicable, regarding the appropriateness of investing in any securities or any investment strategies, including those discussed above. Scientific Metals is a high-risk venture stock and not suitable for most investors. Consult Scientific Metals Corp.’s SEDAR profile for important risk disclosures.